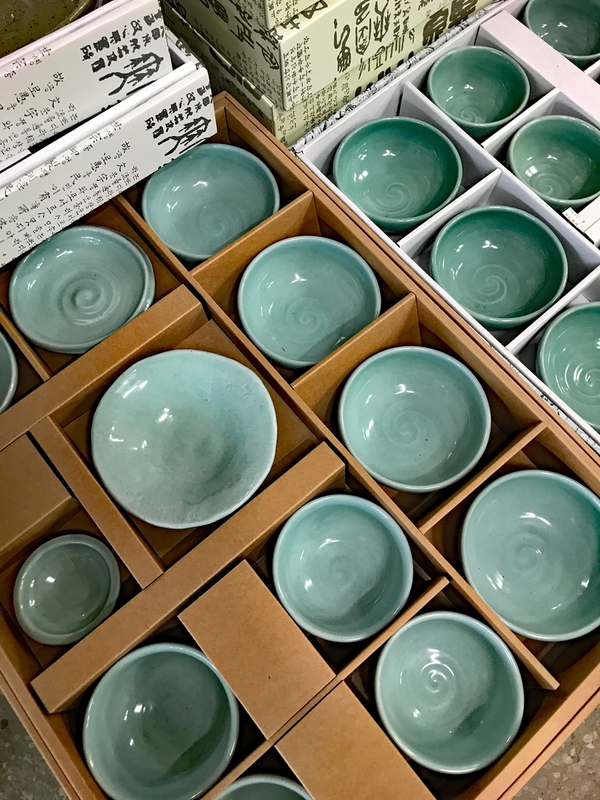 Two weeks ago I had a fun day ogling and purchasing a few pieces of lovely and practical Korean ceramics in the City of Yeoju, a 90-minute drive east of Seoul. 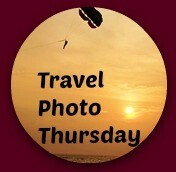 Welcome to week 325 (4/27/2017) of Travel Photo Thursday. Come in and see the pieces that will be making their way back to Canada and my new condo later this year. 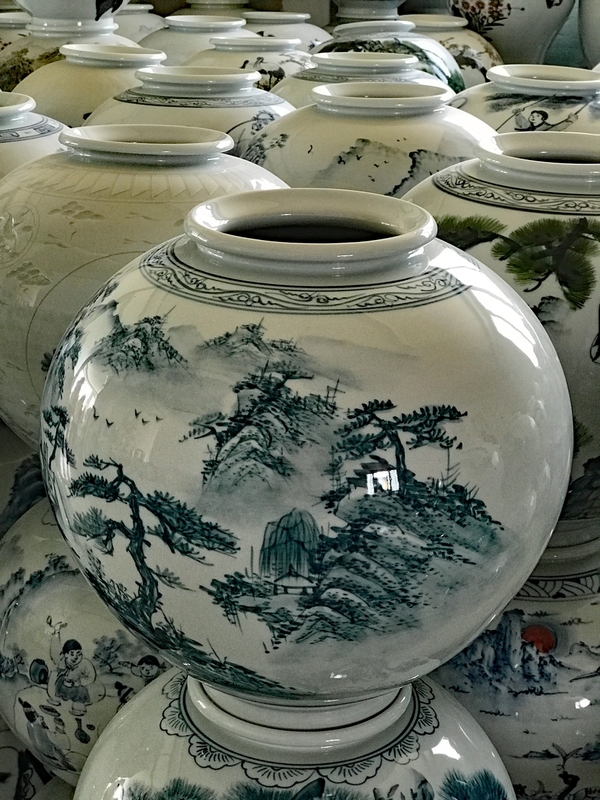 If you are in Seoul and you want to purchase Korean ceramics or pottery, avoid the touristy shops in Itaewon or Insadong. Instead, grab a public bus or find a tour going to Yeosu. 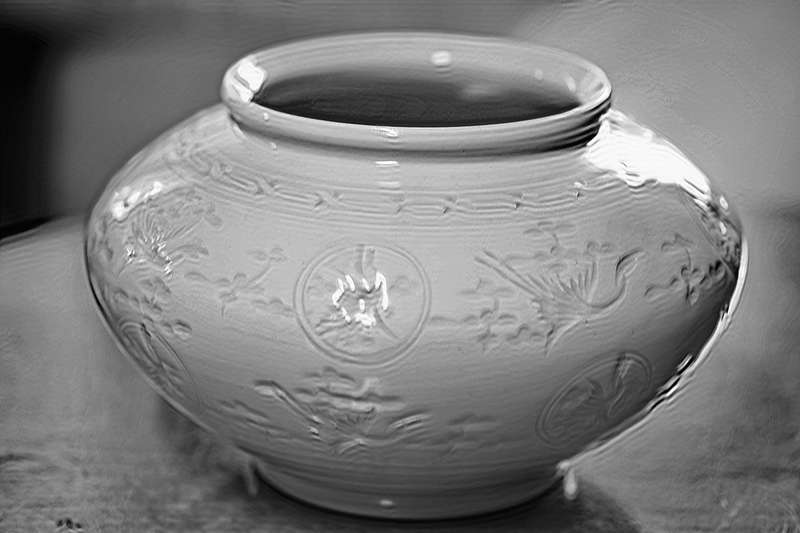 The city has been producing quality ceramics and pottery for centuries. Here you will pay a quarter of the price for the same vase or dish-set you may have eyed in downtown Seoul. Our first stop didn’t look like much, but once inside there were lots to choose from. My first purchase was this stunning white-on-white celadon short vase with cranes for a mere $20.00. I priced a similar piece in Itaewon a few days later, less than half the size and the shopkeeper quoted me $40.00. Our next stop was a shop with loads of gorgeous tableware in a rainbow of colours. 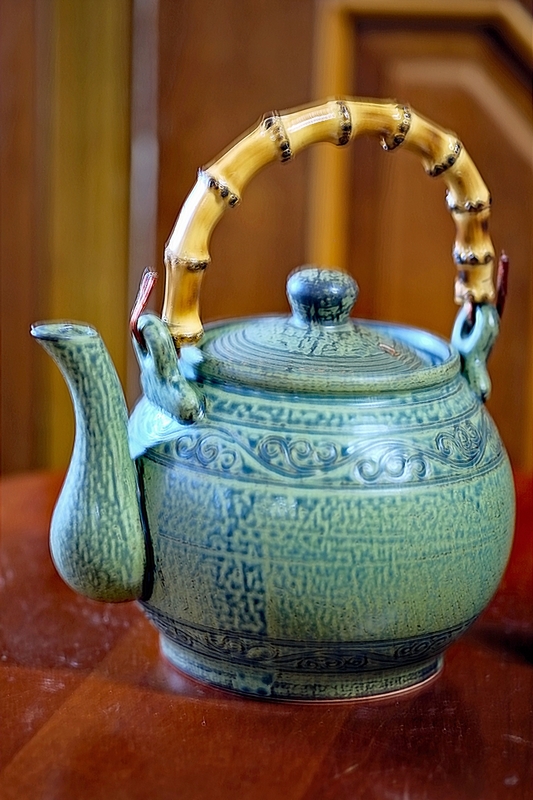 I love tea, and could not pass up this stunning teapot ($25.00). This was a fab bargain as we found them sporting much higher price tags in other shops. I can’t wait to brew my first pot of tea! The bamboo handle is perfectly heat resistant. This stunning piece had my name written all over it for a mere $25.00. This dragon vase was my absolute favourite piece of the day. I lusted over it for quite a while, but in the end, walked away. I think it would be a nightmare to ship back to Nova Scotia, and I would be heartbroken if it arrived in pieces. However, it was almost a steal at 80,000W. I priced a similar piece in Itaewon a few days later and was quoted two million Won (over $2000 US). The shopkeeper in Itaewon went on about the famous artist who had made the one she was trying to sell me. When I asked her to show me the artist’s signature I thought she was going to faint. I walked away chuckling to myself. Believe me, when I say, don’t buy Korean ceramics in downtown Seoul. Update: I did go back and purchase this dragon vase a week later. It arrived back in Canada in one piece and looks beautiful in my new home. 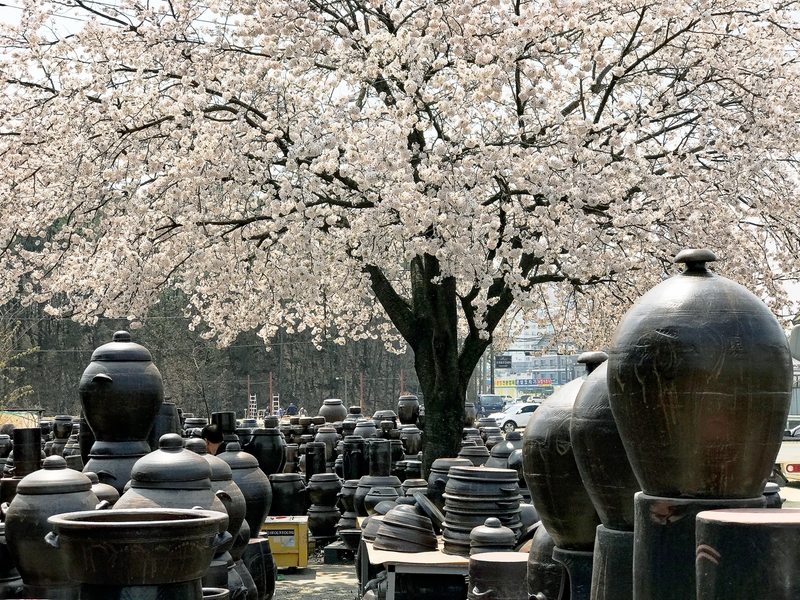 This shop sells every size kimchi pot imaginable and with this gorgeous cherry blossom tree in full bloom what an opportunity to take this stunning photo. I did not even entertain the thought of purchasing one of these pots. They are HEAVY. My tour was all Americans from the base, and they have shipping allowances, so quite a few purchased multiple pots to take home to the States. They make nice coffee or end tables. This was strictly a shopping tour, so we didn’t see anything being thrown, or baking in the kiln. There is a ceramics/pottery festival in a few weeks. I’m planning to go, and I want to see the potters at work. I was fascinated to see the ongii pottery being produced last year. If you are in Seoul, and you want to do some Korean ceramics shopping in Yeoju you can take the subway. Details here. The tour I took is organized by the American base, and I tagged along with an American friend. 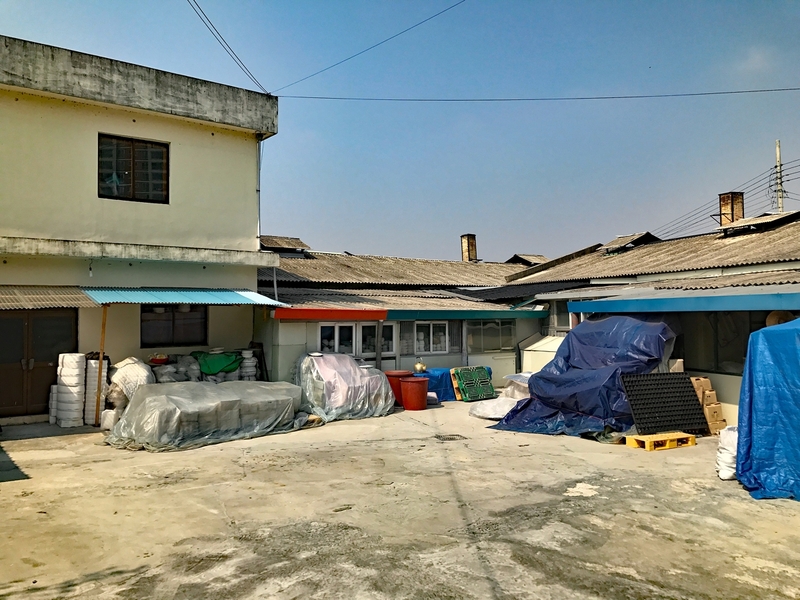 SIWA (Seoul International Women’s Association) sometimes offers a tour, and you don’t have to be a SIWA member. Check out their page. 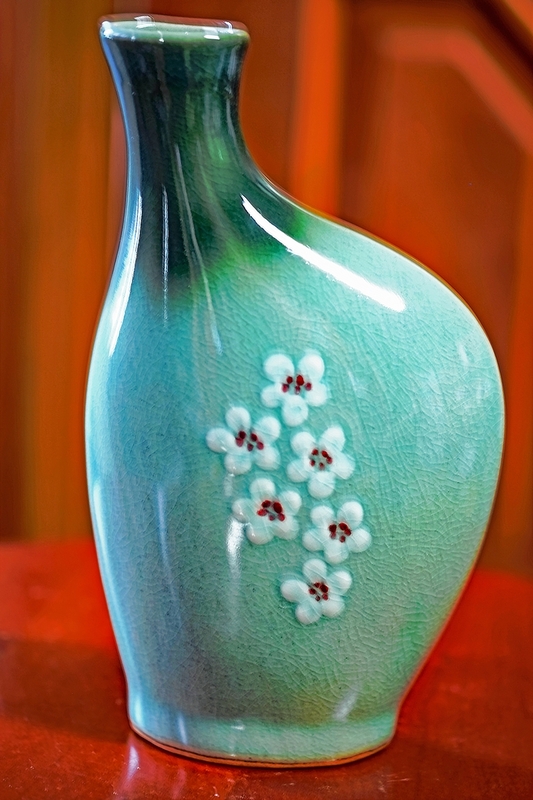 Have you ever purchased a piece of Korean ceramics? Let us know in the comments. OMG I would want everything!!!! I agree, Jackie. I could have bought one of everything. 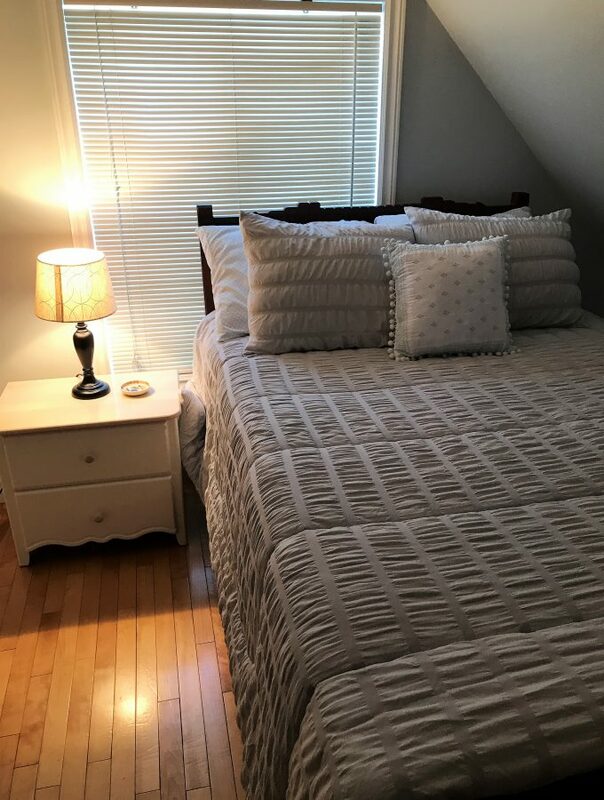 Incredible pieces and incredibly good prices I’d say! They will bring back great memories when you look at them in their places of honor in your Canadian condo! I love buying ceramics/pottery when we travel. I’ve got a few pieces from Turkey, one from Spain, one from Morocco and two from Japan. I don’t spend a lot but I love the pieces I do buy and enjoy using them all the time. I recently bought a bowl (like a pasta bowl) that I usually use as a salad bowl, from the ginger factory on the Sunshine Coast where we now live. It is just a mass produced thing but pretty and I love using it. I would go crazy in your position. I love your white on white and teapot. Hi, Jan. I love the fact that pottery/ceramics don’t have to be expensive. I’m sure your bowl is gorgeous. I’m lusting after these pieces too.  The white on white vase with the cranes is beautiful and I can see you enjoying your beautiful teapot (the shades of blue are lovely) and sipping your tea on a cold Canadian morning. It’s probably good you didn’t have a shipping allowance, right? Hi, Ruth. I’m with you. I hope to get to see some of the potters at work during the festival. I hope you’re not trying to turn us all into shoppers.  That teapot is the winner here. Haha, Bob. Never fear! I’m not much of a shopper. I’m leaving Korea this year, so it’s been on my list to buy a few pieces before I leave. Going off the beaten path is a great idea for pottery buying — and most everything else while traveling! Glad you found new pieces for your new condo. Hi, Josie. I totally agree! 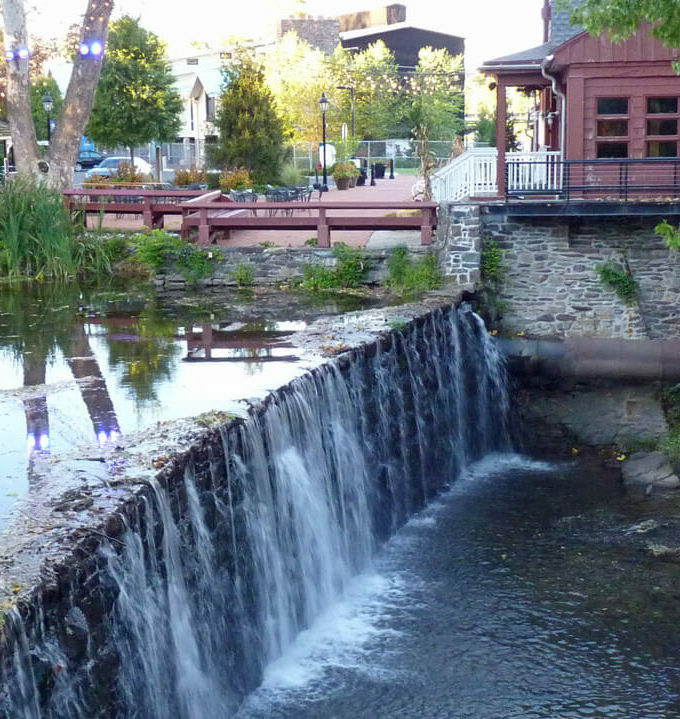 I couldn’t believe the difference in price between the touristy areas and where you shopped. I am sure it was hard for you to walk away from some of these pieces…truly gorgeous!! Hello, could you please provide the name of the tour? Is this available for the average tourist? This tour is offered through the U.S. military base and is not open to the general public. You would need to find someone with access to the base to sign you up and get you on the base. I’m no longer in Korea, so I don’t have a contact to share. The dragon vase was beautiful. I would have been tempted to try to hand carry it home. I’ve done that a few times but it’s not very practical. 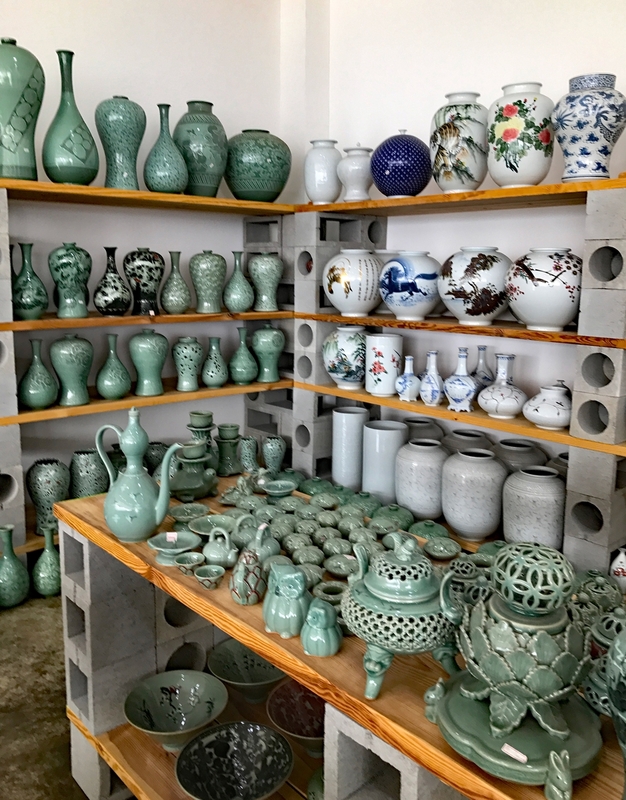 Helpful tips on where to buy ceramics in Korea (outside of the tourist traps). 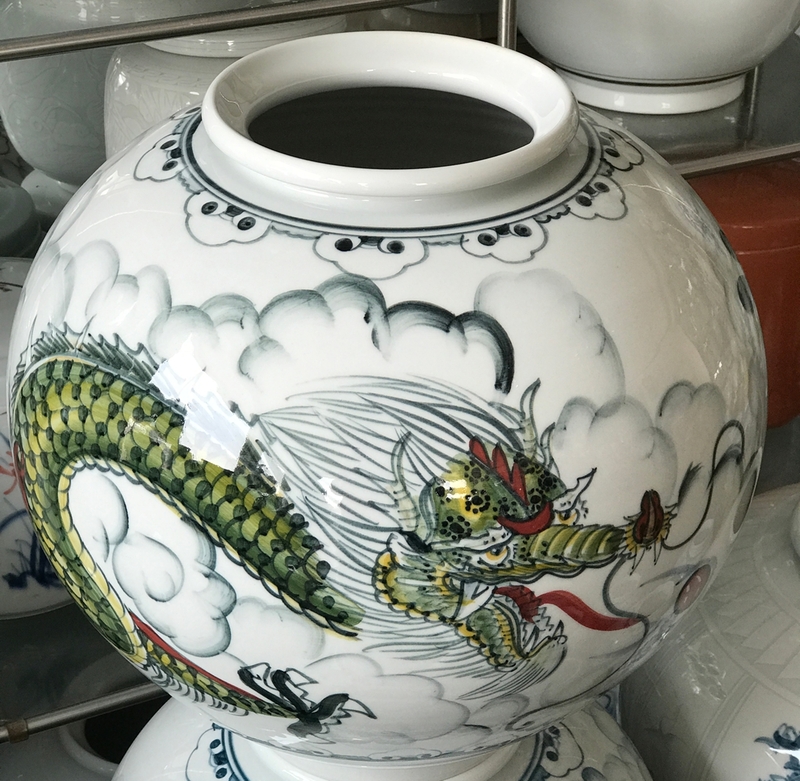 I was so happy the dragon vase arrived in Nova Scotia safely. I did worry that it might not make it in one piece, even though I packed it well.